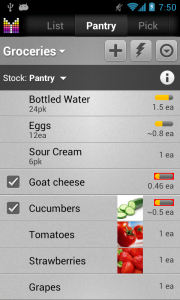 Pantry Manager is used to track product stock in different locations of your house. Fridge, cupboards, pantries are now under your control. Add items to your Pantry list. Set Target Quantity for items. When you checking out, purchased items will update stock in Pantry with purchased quantity. It’s possible to create multiple Pantry lists for different locations in your house. When you tap Checkout button in shopping list, Checkout summary window pops up. Select Update Pantry to get items in your Pantry updated or select Add & Update Pantry to add new items to Pantry as well. If Estimate quantity is enabled, the app will attempt to estimate consumption rate. When you add pantry records along with checkout, consumption rate for these items will be computed automatically on the next checkout, based on the number of days passed since first checkout. When you tap an item under Pantry tab, a record is added to current shopping list. First, the app will try to locate product in Favorites list. If favorite item is not found, the app will search in Pick list. 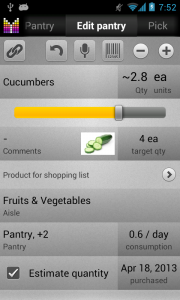 You can modify the related product using Product for shopping list option under Edit pantry. Remaining quantity can be estimated using Consumption rate or Days left. Enable Estimate quantity, set Purchase date, and move slider to set remaining quantity. In a few days remaining stock will be less by the estimated consumption rate. You can switch between Consumption rate and Days left by tapping Consumption field and choosing Show rate or Show days left. You can set Consumption rate manually by tapping Consumption field and entering rate of consumption. Would like to see the product that is consumed is automatically added to the grocery list. Otherwise a very good program. Thanks for the suggestion. 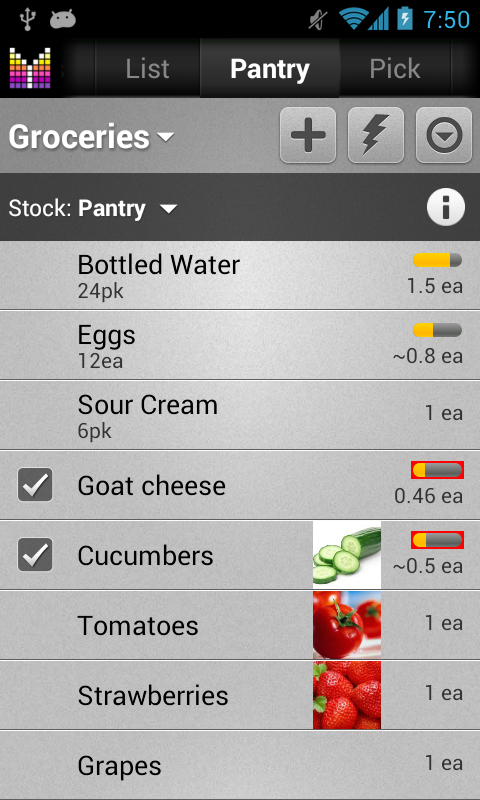 The Plan section should help adding consumed items to shopping lists from Pantry. It’s not clear to me how the Qty, Target Qty & Reorder Qty inter-relate. For example there are 6 cans of diced tomatoes in the pantry and the target quantity is 12 (I assume the target to be what I want kept in the pantry). I click the tick box on the left to select it for the shopping list but before that do I set the re-order qty at 6 manually or does the app set the top up for me based on the difference ? Richard, Qty represents your stock, Target Qty represents the stock you’d like to have. When Qty drops below Reorder Qty, the pantry record appears under Plan tab and you can tap the record so that the app would add the difference between Target Qty and Qty to your shopping list. Hopefully this helps. I am still learning how to use your very flexible app. I would like to find a very easy way to reduce the quantity remaining in the pantry by one. Right now, I believe I have to find the item in the pantry, click edit, and then click the minus button. Is that right? This would be ideal: When I finish something, I scan its barcode, which automatically reduces the pantry quantity by one and updates the shopping list if necessary. 1) When I finish something (eg. a can of soup) I click one button in the app and this starts the barcode scanner. After scanning the item, the quantity is reduced in the pantry by 1. 4) When I checkout, your existing feature would update the Pantry quantity with the purchased amount. Peter, thanks for your considerations. You could scan barcode in Pantry now and appropriate record will be highlighted. You can reduce its Qty there. If the app would reduce Qty automatically, there may be inconvenience for those users who would like to populate Pantry by scanning items. Therefore implicit reduction of quantity may not always work. Are you suggesting that the app should automatically populate your shopping list using Plan? Again, there are certain cases when implicit population may not work. In the future update it should be possible to add all items from the plan to shopping list with a couple of clicks. Which I hope is acceptable. Thanks and feel free to let me know your further considerations. Alex, thank you for your quick reply. Once I have set up your excellent app with the groceries I buy, and the pantry with the reorder quantity and target quantity, then I would like everything to be automatic, with absolutely minimal keystrokes and taps. There would be two widgets on my phone – Consume and Buy. When I click Buy, the shopping list pops up. Just like you have now, I check off the items as I put them in my cart. When I click checkout, the pantry is updated correctly, and the app closes. One alternative idea is that maybe the shopping list is updated as soon as an item is consumed, and then is marked in the shopping list as URGENT somehow when the reorder quantity is reached. That way, I could postpone buying items until they are on sale, or if they are on sale now, I could buy extra ones. If they were not marked URGENT, then I would know that I still had some in the pantry. The two main ideas here are that the shopping list should be populated automatically from the pantry, and that updating the pantry should be one tap on the magic Consume button. With this simplicity, I could teach my young kids to “Scan the cereal box when you finish it”. I would not have to check stock levels manually before shopping. Peter, this sounds like a good idea for the future improvements in Mighty Grocery. Thanks so much! Being able to scan more than one item at a time would be great. Its real pain scanning one item and adding it, hit done, lighting bolt, and scan the next item. I am trying to setup two pantries, one for my parents and one for me, which I realy glad you have the expiration date to add its a great help. David, thanks for your feedback. Kindly note that you could add barcode scan button on top of the toolbar. Tap Side menu button > Show sidebar > long-tap Barcode button. How do I search in the pantry? Andrew, you can search in Pantry as in other sections of Mighty Grocery under More > Search. Tap Filter and check Pantry as the only search scope. When I tap on filter from the menu in pantry, it only lets me sort, which kinda threw me off. Andrew, thanks for your response. We will consider improving search and filter in Pantry and other lists. Is there a way to view Pantry lists on the web version? I was hoping there was a way to view/export my pantry lists besides on my phone/mobile device. Whenever I push my lists, only grocery lists appear on the web interface. Kevin, unfortunately it is only possible to sync pantry lists between devices now. We plan to add ability to edit pantry lists online going forward. Sorry for the inconvenience. Ian, I apologize for the inconvenience. Unfortunately, there is no release date, but we plan to make this possible in the future. Please explain how to create multiple pantry locations within my house. It seems to me that it would be helpful to set up pantry locations in Settings and then assign the pantry location to each item in my lists. For example, Milk from Giant Food which is on aisle 20 and Milk from Safeway which is on aisle 14 could both have a pantry location of Refrigerator. By the way, I have learned to copy an item from store to another store so that I can assign the item to the proper aisle within each store. I use custom aisles that are preceded with the aisle number (01, 02, etc.) so that I can walk the aisles in order. Roy, there are two ways to create multiple Pantry locations. First, you could create a Pantry list under All list tab. Just go to All lists tab > select “Pantry” on the top > tap Plus button > enter Pantry list name. Second, you could customize aisles for the Pantry list and create aisles such as “Fridge”, “Pantry”, etc. The first way is recommended unless you find second option to suit your needs better. Share pantry list: Can the expiry date be inserted? It could be useful. Also sort the list after the expiration date would be great. Wolfgang, yes, it is possible to set Expiry date for items in Pantry. We will consider adding ability to sort by expiry date going forward. Are you working on this filter?